Save time and money with this BUNDLE! 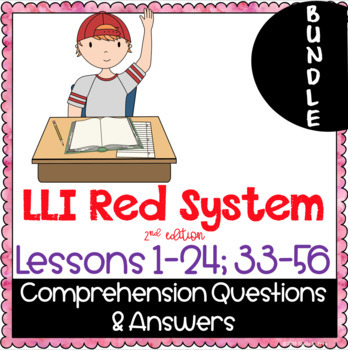 This BUNDLED resource was created to give students additional comprehension practice for EACH of the Leveled Literacy Intervention (LLI) Red System books, Lessons #1 - 24 (Level L) AND Lessons #33 - 56 (Level M). There is one comprehension printable per text. 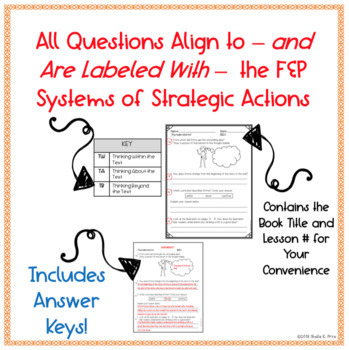 Each comprehension printable contains questions that align to Fountas & Pinnell’s Systems of Strategic Actions: Thinking Within, About, and Beyond the Text. The questions are labeled accordingly on each page and span a variety of question types (multiple-choice, short answer, graphic organizer) to address different learning preferences. NOTE: This does NOT include questions for the Novel Study. NOTE Part II: Leveled Literacy Intervention® is a trademark and/or registered trademark of Irene C. Fountas and Gay Su Pinnell. This file is an independent product and is not affiliated with, nor has it been authorized, sponsored, or otherwise approved by Irene C. Fountas or Gay Su Pinnell.